[When I was fourteen I fell in love with a boy in a painting. Leonardo da Vinci painted Cecco’s portrait five-hundred years before we met as teenagers in 2001. We lived on opposite ends of the Italian renaissance, as close as twin sides of a gold florin. And then there was the accident and I died for a while. When I regained consciousness, fifty-two years had passed and my next incarnation had picked up the threads of my life and moved on. She is me and not me, and now she’s falling in love with my boy. Cecco was more than Leonardo’s favorite apprentice, he was the son the master never had. I like to think Cecco is the reason I was born twice, and for the most part he is, but while I want to rest in peace with my beloved, my usurper, an artificial hybrid designed for time travel, intends to exact revenge on the art syndicate that exploited us. The ‘creature’ may have a physical body to whisk her to 15th century Florence… but I have the spirit to transcend the body and I’m not about to let the love of my life slip into another woman’s heart. I have no intention of receding into the Shadowlands without a fight. AI = autistic intelligence… ‘state of the art’ time travel just became transcendental… sometimes it takes two lives to make one woman. The story concludes in ‘PEARL BY PEARL’. 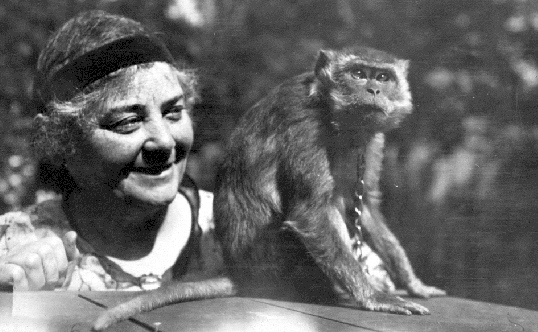 Eccentric artist and iconic spinster, Emily Carr, comes to her senses sixty-seven years after her death and calls down the energy of her animal totem, Woo the monkey, to rekindle the love of a rejected suitor. Now she must embark on a posthumous quest to find the persistent admirer who wooed her while she was alive. 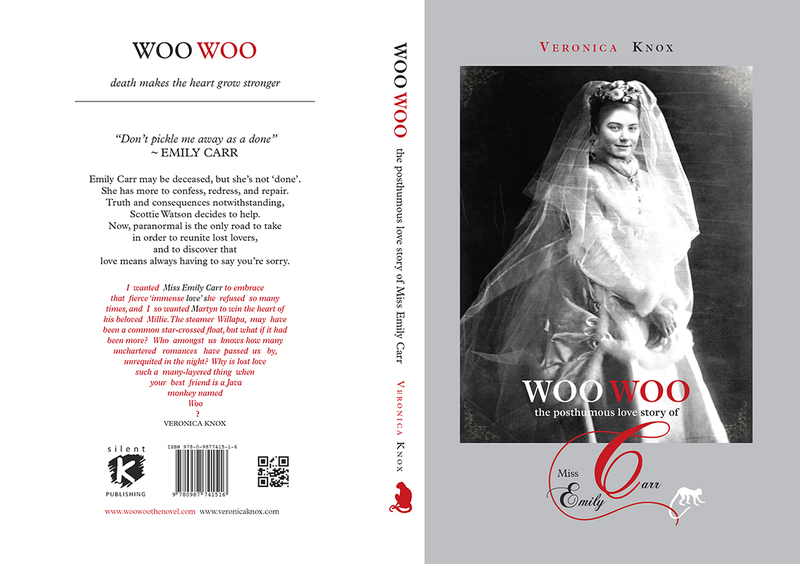 The invincible Emily shattered most of the rules that confined the women of her Victorian age, but she died a spinster. Something covert made her shy away from courtship and marriage. Instead, she focused on the romance of creating art. Her diaries offer tempting snippets of loves lost and a secret admirer she loved her from afar. Maybe lost love isn’t so uncanny when your best friend is a matchmaker monkey named Woo! When the last red leaves fall, the October sky darkens with rain and snow, and the frost on the pumpkin glows silver in the moonlight, banish the endless stream of seasonal macabre that play on human fear. Relax into a haunting story from the borders of the afterlife where historical fact meets wildly imaginative fiction, the ghosts are family, twists of fate transcend time, and love is more powerful than death. WHAT IF – a Y/A time-slip fantasy links Pangea, Ancient Egypt, Mars, and a mystical corner of Northumbria near Hadrian’s Wall? What if a band of topiaries wander the grounds of a disgruntled stately home at night? What if a colony of royal cats held the secret of time travel? What if the Green Man, Leonardo da Vinci, Nicola Tesla, Vincent Van Gogh, and C.S. Lewis aid a pair of telepathic twins to resolve an ancient curse? (The Bede Trilogy: ‘TWINTER’, ‘TIME FALLS LIKE SNOW’, and soon *book 3 to be released in 2019, ‘TOMORROW AGAIN’). Whatever you call them: amulets, trinkets, keepsakes, or love tokens, sentimental objects retain the ghosts of their owners, and mistaken identities hide bigger pictures. the heART of humanity is in the details. What do we actually know about Sandro Botticelli? What can we possibly know? These are two different questions, and we can only answer the latter – the educated guess being no more valid than an emotional one. Botticelli’s face proves how much more he was than a generic woodcut printed in the frontispiece of Dante’s Divine Comedy, a book he illustrated. A self-portrait, more than any other, is an accurate representation of a physical person. Behold, a haughty moment captured from a prolonged gaze in a mirror. Introspection fused to a defensive reflection. Vanity? Perhaps. Here is a man turned out for deliberate remembrance, critiqued to the full extent of his professional examination. Clean-shaven and well-dressed, titian hair aglow. Eyes blazing life. Fire under the skin. Smouldering. Here is a whole person. Here is Tuscan sunshine glinting off the gold threads of an apricot cloak. An image of oneself usually survives vanity only after it is found favorable. Is it flattery? Most definitely. Why else would a professional portrait painter abuse his best mode of self-promotion? But the first question haunts us. What do we absolutely know? 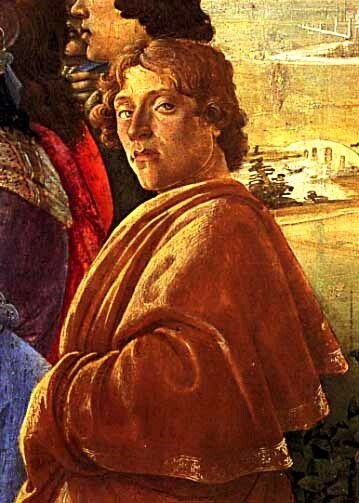 We know Botticelli once lived and there were days when he breathed under an apricot cloak. We know this cloak is now dust – lost in the refuse of daily things. We know Sandro has been a child and a teenager and an old man. We know that the days during which Botticelli painted his portrait, he walked away from his mirror to eat and drink. He laughed and concentrated between sips of wine, and then he painted. 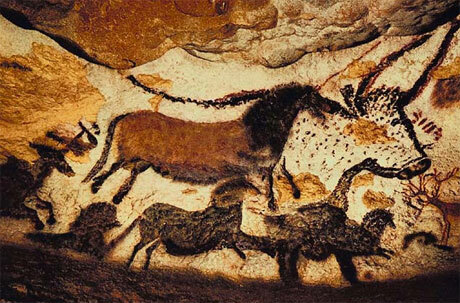 We know that at one precise moment he set aside his brushes, deciding his work was done, which is a significant moment for an artist. We know Sandro’s portrait remains alive as testament to his chance for creative immortality. 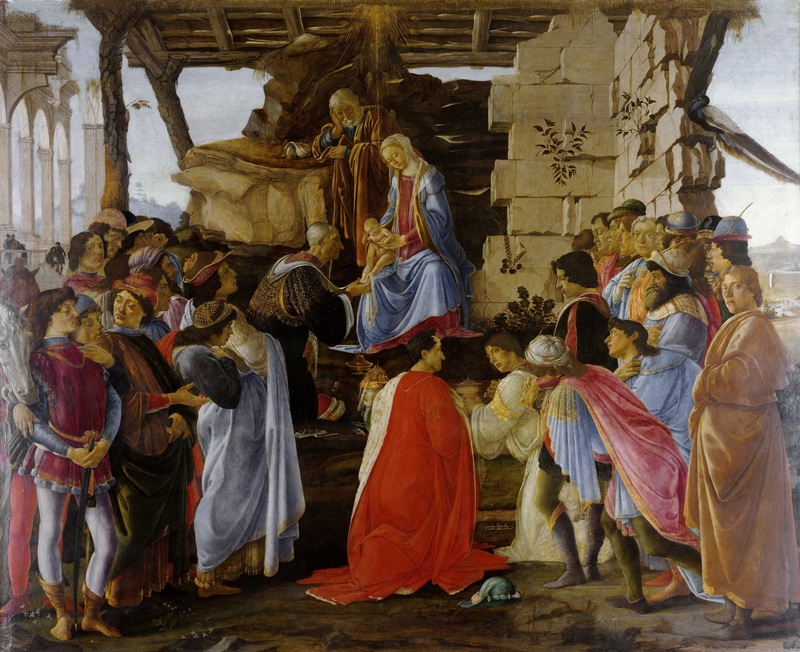 And we know Botticelli’s Adoration of 1475 was left to dry in the musty air of an artist’s studio, wet and vulnerable in a corner, while other work continued around it. It is clear that no serious accident befell it when it passed from hand-to-hand… or did it? I doubt Botticelli painted a horse so ill-placed as to fall out of the picture plane. I suspect someone tampered, hopefully after the artist’s lifetime. 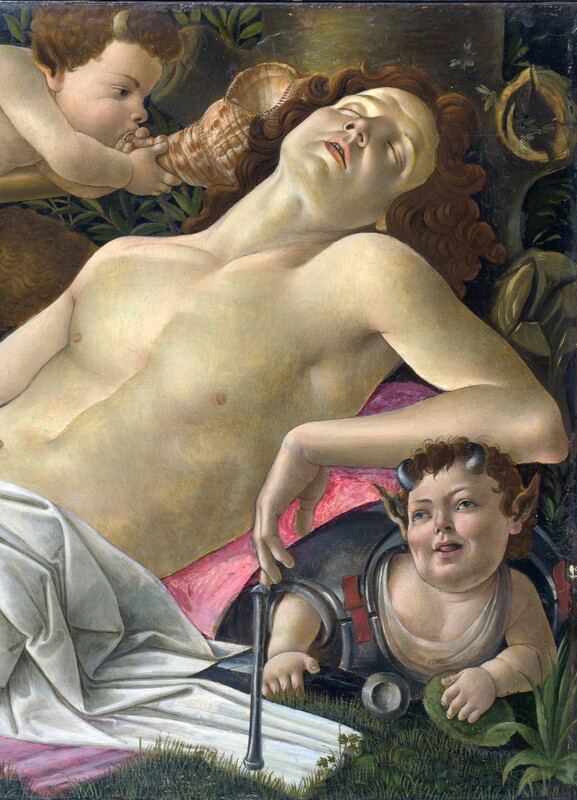 But, back to my subjective view as an author: Botticelli is having an intimate tease with us. Do you not feel it? He is there. He has survived five-hundred years of dust to meet us face to face. To stare into our eyes, soul-to-soul. 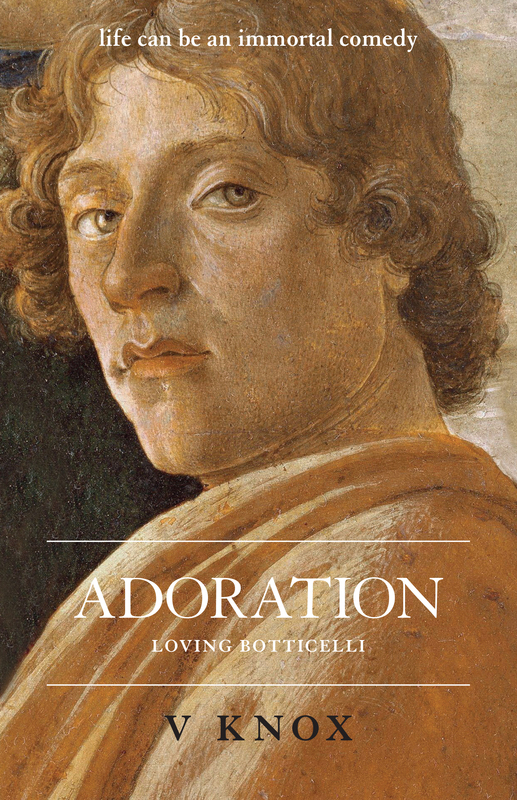 Botticelli is ours now, to marvel at his silenced thoughts transmitted from eye-to-eye. I believe he was well satisfied with his portrait. 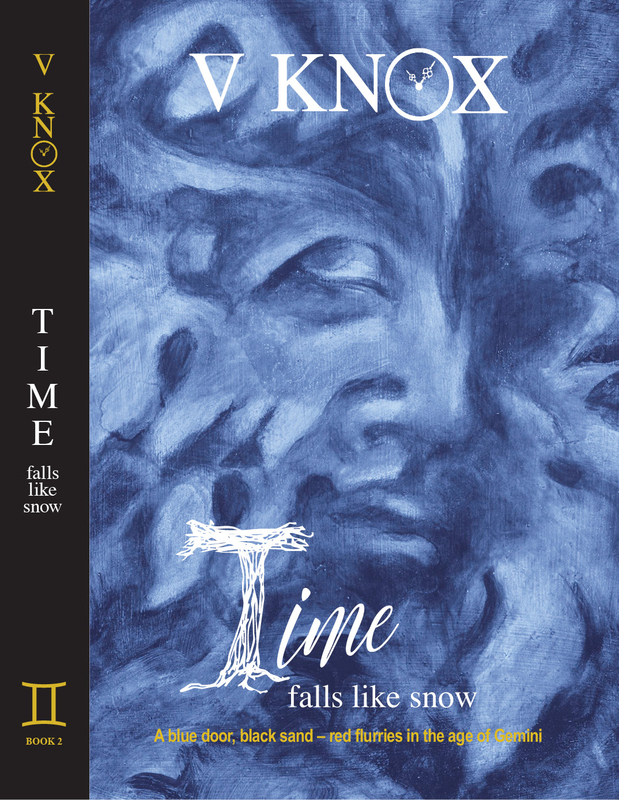 In ‘TIME FALLS LIKE SNOW’ – book two of the Y/A ‘Bede Trilogy’ by V Knox, Bede Hall, an indignant stately home riddled with time portals, is once again under siege from financial woes and local developers. But this time, it’s under attack by a newly-awakened supernatural enemy. Enter a pair of equally demanding enchanted chairs with a mission of their own that engage resident teenage twins, Kit (Christopher) and Bash (Bathsheba), in an extraordinary partnership to overcome an ancient curse. 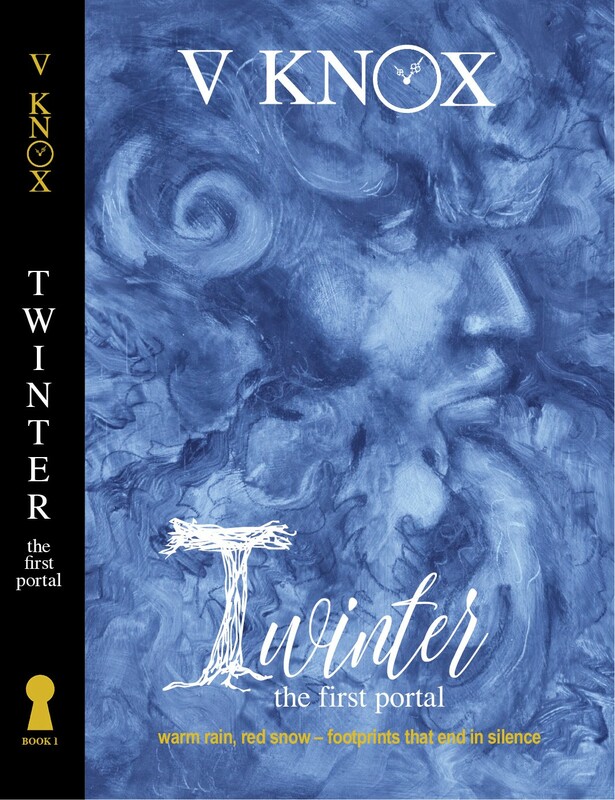 As the chosen champions foretold in a winter prophecy, the telepathic twins must set aside being normal teenagers and face the responsibilities of preventing a disastrous event that threatens the survival of Bede Hall as well as the future of the planet. Bash, has always been a supercharged bossy boots ‘know it all’ – a wordsmith extraordinaire who loves to tease her serious brother for fun, but as Bede Hall’s designated ‘mistress of the green’ she’s charged with grounding the energies of the Hall’s gardens and woodlands, until the return of the Green Man restores the land. But Kit, Bash’s budding scientist brother who, other than ghosts, denounces all things supernatural as optical illusions or hoaxes, believes he has a logical explanation of the bizarre events unfolding in Bede, and in spite of some unexplained events to the contrary, has no intentions of swallowing the hairbrained idea that the Hall orders its residents to do its bidding and controls the weather. Nor does he accept being appointed the designated time traveler to intercede for Bede Hall in the hope of reconciling long disputed interests in the distant past. 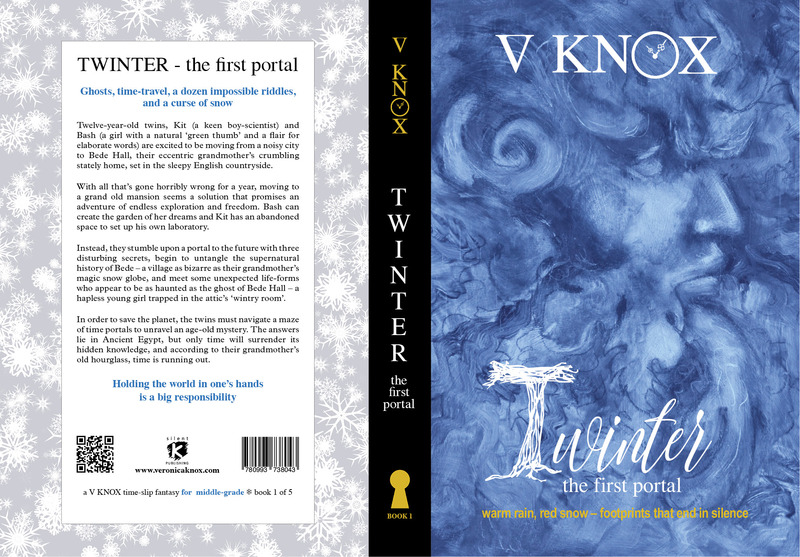 Together with a team of resident ghosts and sentient animals called the ‘Twinters’ and a village of decidedly odd residents known as the twice-borns, the twins agree to disagree. The word existential delights wordsmith Bash, but even though the twins have always read each other’s minds, and Kit has logically reasoned out that ghosts are scientifically legitimate forms of purely organic residue, welcoming interfering sentient chairs as necessary allies is a challenge too difficult for him to digest. Even so, he’s beginning to accept he may have actually time- traveled during a dream-like vision of a wintry future, an admission he’s keeping to himself. Kit and Bash Stratford-Smyth have never needed extraneous devices to hear each others thoughts, but time is a dimension too deep for telepathy to connect. They liken ‘chair chat’ to a childhood game using a pair of tin cans on a length of string as a playful telephone. 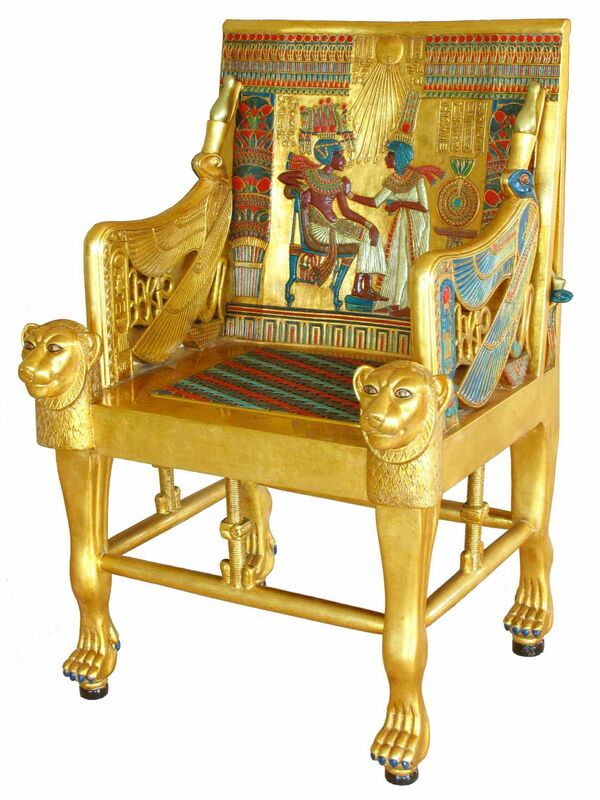 Their opposing approach to enchanted chairs is distinctive – a simple science experiment for Kit to disprove, and confirmation of supernatural extrasensory hearing for Bash. But one way or another, they must set their differences aside for the sake of the future and comply with a new set of rules. 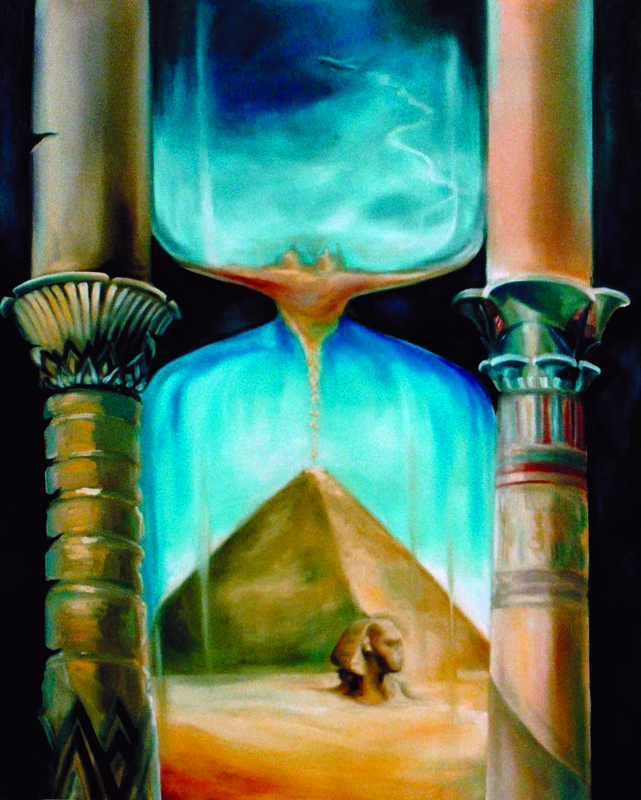 One thing remains obvious, once separated by three-thousand-five-hundred-years and two-thousand-seven-hundred-miles as the falcon Horus flies, thoughts shared across time bring a whole new meaning to let’s sit down and have a chat. In the meantime, pull up a chair and read closely, secrets are about to be spilled as Bede Hall’s prickly personality continues to dominate a landscape that’s decidedly ancestral. 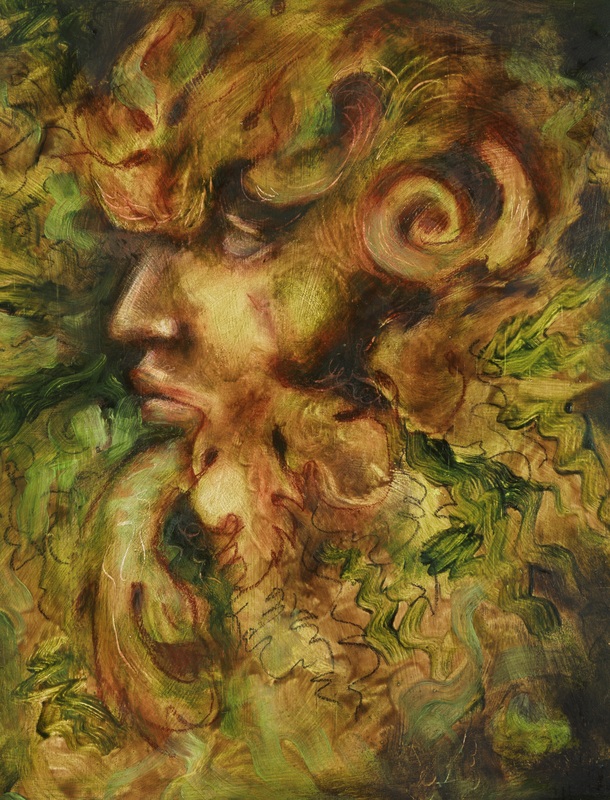 The ‘Green Man’, is a mythological figure depicted with leaves for hair, in the tradition of the god Pan, protector of woodlands and defender of natural green spaces. He is usually green or autumn colors, depending on the season. But when the Green Man is absent from the countryside, vegetation atrophies, legend declares a permanent winter settles over the landscape, and the world hovers in a state of frozen decay. Winter looms big in the ‘Bede Trilogy’ set in a liminal landscape where reality meets enchantment and a sentient stately home presides over an area of Great Britain linked irreversibly with Pangea and ancient Egypt. 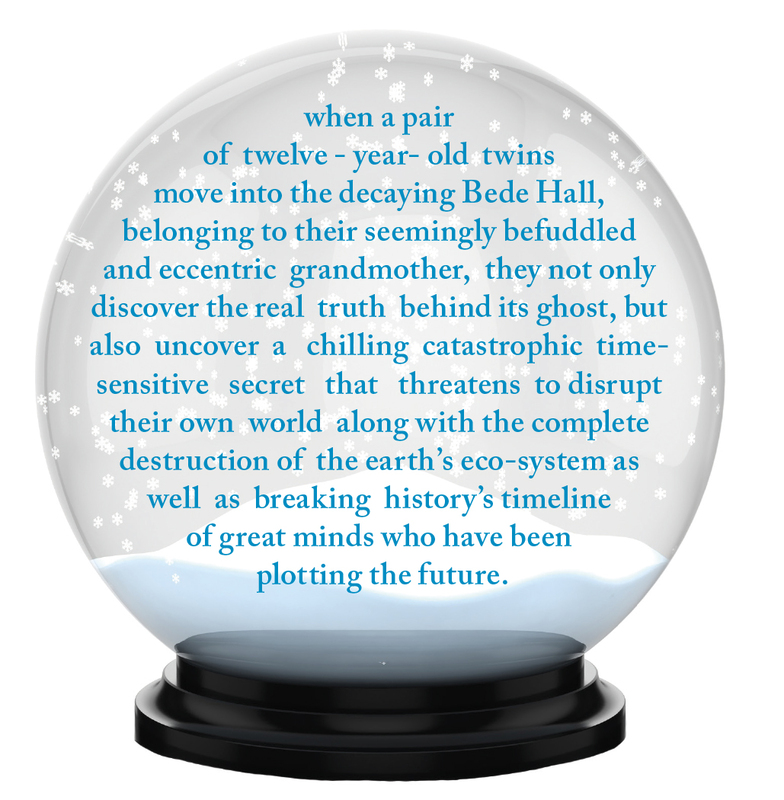 Ghosts, time-travel, a dozen terrible secrets, and a curse of snow takes a pair of telepathic twins on an adventure in ancient Egypt and into the future where the safety of earth’s ecosystem lies in their hands. Twins Christopher (Kit) and Bathsheba (Bash) Stratford-Smyth who live in a suburb near London, are twelve when their Egyptologist father goes missing from his dig in Egypt. Meanwhile, Bede Hall, their grandmother, Lady Nan’s stately home in Northumbria, is in danger and not a little angry. It feels cruelly abandoned at its hour of need, put up for sale while its matriarch, oblivious of her old home in danger of being sold to shady developers, has intentionally distanced herself from exhaustive responsibilities by retreating into a fog of happier memories. While the Hall faces being turned it into a commercial venture, or demolition, Lady Nan dreams on about a previous life she remembers in ancient Egypt. But the Hall has no intentions of being sold without a fight. In desperation, it summons its considerable powers and orders Lady Nan to wake up and return home. 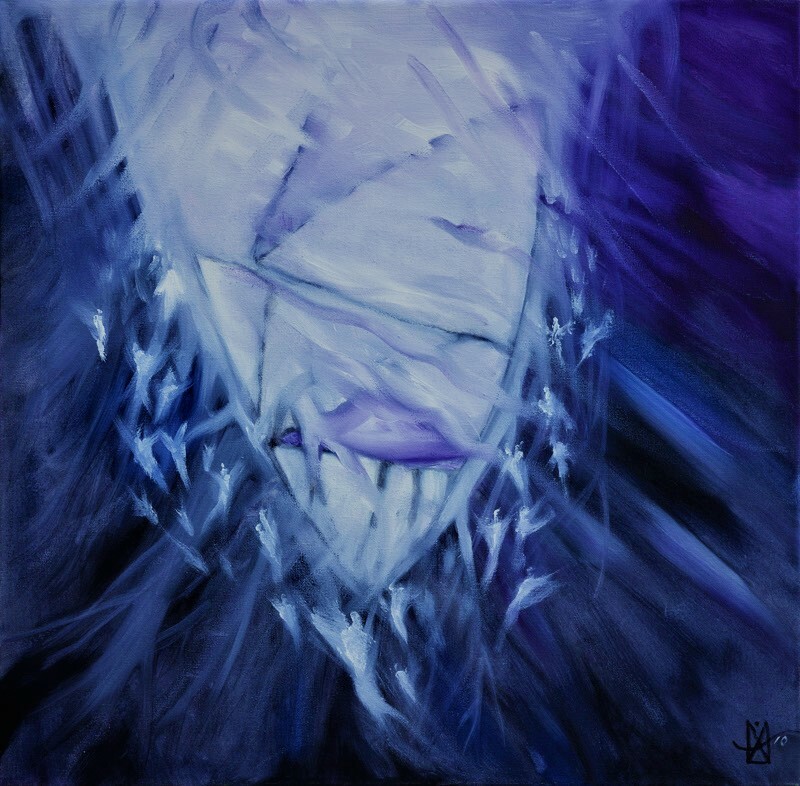 Excerpts of V Knox’s novels and samples of her artwork may be viewed on this website. The illegitimate son of a lawyer and a woman we know only as Catarina, is born in the town of Vinci, in Tuscany, Italy. The child’s unspectacular entrance into the world is minimalized to protect the reputation of a prominent family. The boy is ‘stored’ out of sight as an unlikely heir if there are no legitimate sons. His mother is hurriedly married off to a brutish local mercenary for a fee, and dispatched in disgrace to a remote location in the surrounding countryside. Leonardo da Vinci disappears, unsung, to live in a rough peasant’s cottage and fend for himself against a bully of a stepfather and a downtrodden mother. But, he escapes early into the landscape that offers him sanctuary. 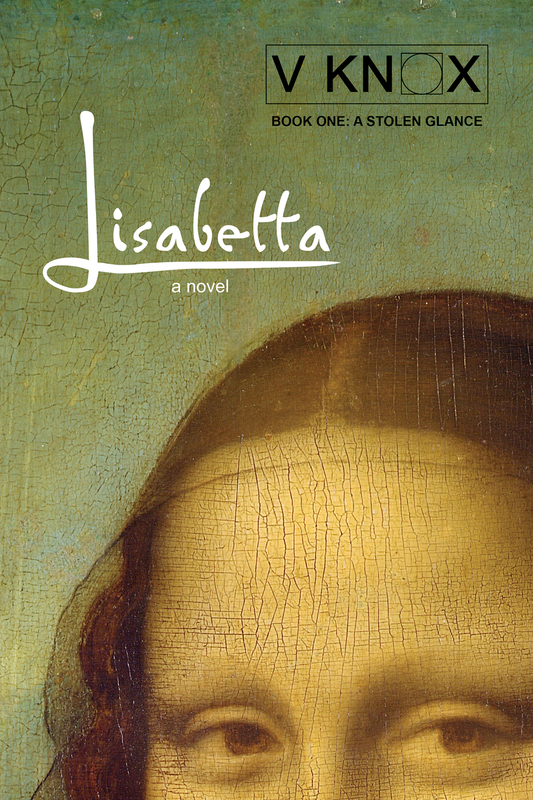 A retreat that soon becomes his playground and school, and Leonardo emerges a ‘renaissance boy’ who will change the course of art, engineering, and science. During his sixty-seven years, Leonardo fills copious notebooks, meticulously recording his every waking idea accompanied by endless detailed diagrams and side-notes. The deepest longings of his mercurial nature are hidden in plain sight between the lines of his eccentrically encoded entries. But privacy is paramount to Leonardo and he remains guarded concerning the dreams and memories of his anonymous childhood. 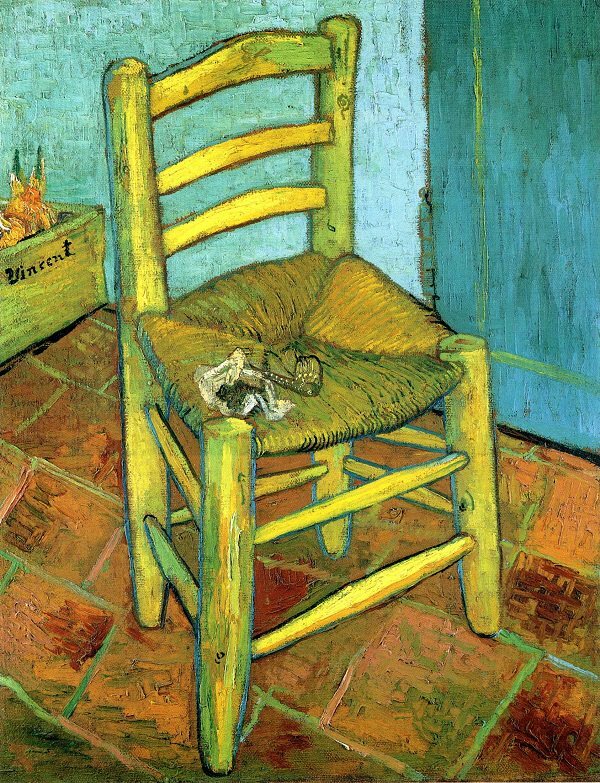 Other than posthumous hearsay, little information has survived of the master’s early years. Hindsight delivers a few anecdotal stories. Fate steps in, more mysterious than the smile of a silk merchant’s wife whose face reincarnates as the most famous portrait in the world. RMS Titanic, declared unsinkable, sinks on her maiden voyage, in the freezing waters of the North Atlantic 370 nautical miles from the southern coast of Newfoundland, Canada. 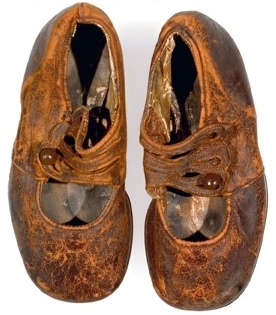 In a few years, an artifact of contraband salvage, a pair of baby shoes kept hidden in a drawer, makes its way into the Halifax Maritime Museum in Nova Scotia – a poignant reminder under glass of one of Titanic’s many unknown child passengers. The remains of this April day in 1912, relies on what is recorded: the diaries, the first hand reports, telegrams and letters, the anecdotal hearsay, the speculations and embellished theories of hindsight, and the newspaper clippings. Take a moment today to honor the passengers of RMS Titanic as well as celebrating the birthday of a dismissed child who survived his shaky childhood beginnings to become the quintessential ‘renaissance man’ who changed the history of art forever. The newspaper boy immortalized in the photograph has long since passed on, but the headlines he’s brandishing grow evermore sensational. In 1985, the Atlantic gave up Titanic’s resting place, a few of her secrets, and hundreds of recovered treasures that evoke a sense of luxurious despair and compassion. 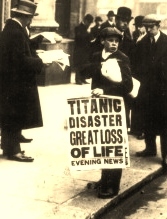 And not long after, in 2009, Millvina Dean, the youngest passenger and the last survivor of Titanic, succumbed to the pages of history. Now, more than ever, untold stories rise from the depths of a writer’s imagination to move readers eager for truths entirely ‘stranger than fiction’. I liken the writers of today’s fiction to the wandering minstrels of old who fanned the fading echoes of folklore into trailblazing songs of derring-do. Stories of heroes that once traveled by word of mouth are rewoven from lost threads to the latest word of research, into novels and screenplays and movies of mythological proportions. But, even ghosts have muses. We authors persuade story phantoms to unlock the past, air their memories, reveal their heartbreaks, and narrate their untold stories. In this tradition, bookends of life and death, 460 years apart, have inspired two of my stories. From anonymity to the most recognized face in the world. 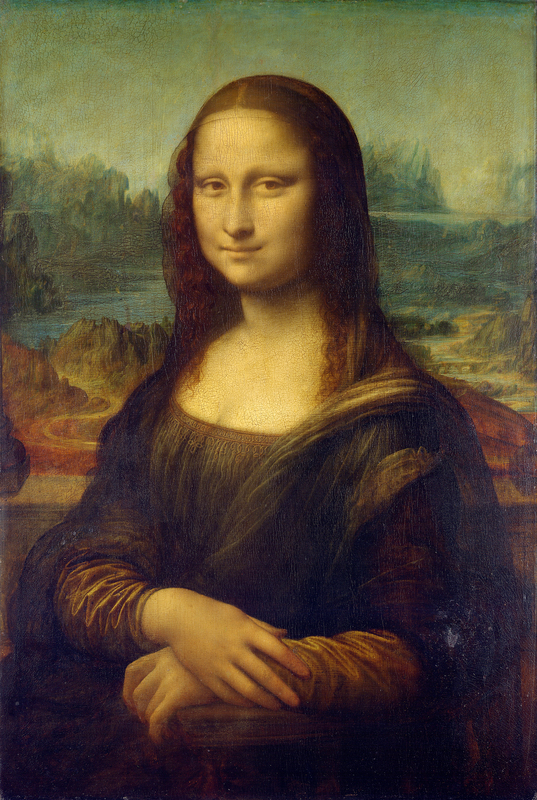 For five-hundred-years, the embittered spirit of the ‘MONA LISA’ has been trapped inside her portrait, waiting impatiently behind her smile to redress a five-hundred-year-old case of mistaken identity. To be liberated from her portrait and reclaim her rightful place in history as Leonardo da Vinci’s sister, Lisabetta awaits a special advocate to champion her cause – an autistic boy seeking recognition within a society that dismisses him as flawed. ‘Lisa’ has no intention of allowing either of them to remain anonymous. ‘Lisabetta – a stolen glance’, book one of four, is scheduled for launch on Amazon in June 2018. 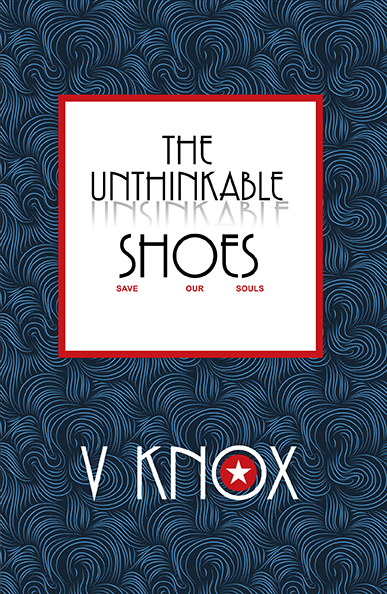 ‘THE UNTHINKABLE SHOES’ – a ghost story of reincarnation and willpower about a boy who loses his shoes between heaven and the deep blue sea. When death separates a pair of child passengers onboard Titanic who were destined to marry, the ghost of the boy chooses to remain earthbound as the surviving girl’s invisible childhood companion in order to reach heaven. Finding a pair of lost shoes is their one chance to stay together.